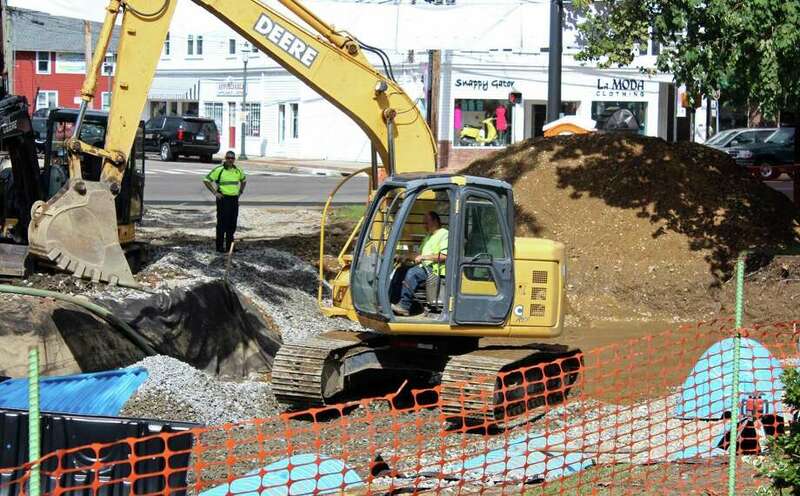 Work to improve drainage downtown is underway at Sherman Green. FAIRFIELD — Even the project designed to mitigate flooding downtown found itself inundated with water after another round of torrential rains Tuesday night. Water was being pumped from Sherman Green on Wednesday morning to allow work to continue on the project, funded by a $300,000 Small Town Economic Assistance Program grant received in 2016. The area near the green is the site of frequent flooding due to inadequate storm water detention capacity, according to town officials. The project includes the installation of an underground storm water detention and infiltration system at the green, which is now dug up and surrounded by orange fencing. Additional catch basins, manholes and drainage pipe will be installed along Sanford Street and some neighboring streets. The work is being formed by Norwalk-based Deering Construction. Initially, the project was slated to be done last year, but Hurley said work was delayed due to the event schedule at the green, along with a delay in gathering needed engineering and survey information and putting together the bid. A one-year extension on the grant was requested and received last year. The project went out to bid in March. The green hosts a variety of events, particularly during summer months with concerts several times a week. Barnhart said there is a tight window for completing the project because the work needs to be done and the grass restored before there is a hard freeze. Hurley said there was discussion of doing the project in phases, but that was ultimately rejected in favor of doing the needed work with no stoppages. He said the intent is to divert some water from entering the system in the first place by using dry wells, and provide additional retention capacity to hold back some of the water. A second project, largely completed, installed about a dozen dry wells and other drainage structures. The other piece of the Sherman Green project involves pedestrian improvements to the green and surrounding area.